1. When they tried to sell these overpriced vintage items and charge extra for ‘flaws’. Who is spending $650 on dirty overalls? 2. 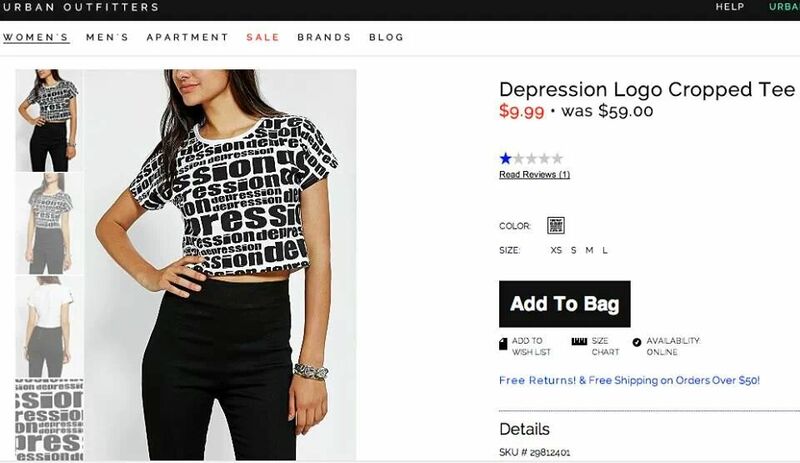 That time they tried to make depression cool. 3. When they ripped off an independent artist’s jewelry design. Some may argue this is coincidence, but the artist claims Urban Outfitter ripped off her design, lowered the prices and even stole some of the artist’s item description copy. Read the full story here. 4. When they released this “vintage” blood-stained Kent State University sweater. They were blasted for their insensitivity towards the 1970s shooting. After an uproar on social media, the company pulled the sweater from their online store. Read the full story here. Amazon actually holds the title and has sold 4% more vinyls. Read the full story here. A horrible message to send to the impressionable teens that shop at the retailer. See the uncensored tweet here. 8. When they turned a blind eye to the sexual harassment of an employee. They refused to call the cops with a man was caught video-taping up employee skirts and another man aggressively grabbed at an employees chest. Read the full story here. 9. When they tried to capitalize on Hindu Deities. “Lord Ganesh was highly revered in Hinduism and was meant to be worshipped in temples and home shrines and not be wrapped around one’s feet.” Read the full story here. 10. When they had a really, really bad sale. That’s not how sales work, Urban Outfitters. Ugh, they’re just as bad as Zara. When will retailers learn?! Read the full story here. It’s probably cheaper at Target. In America, 280 lives were lost and there was over $68 billion dollars worth of damage, but free shipping makes everything better, right? 14. When they screwed up the packaging of this persons order. The receiver had 2 out of 8 items he purchase delivered and damaged their items. See the full story here. Do you know of any other times Urban Outfitters failed? Let us know in the comments below!